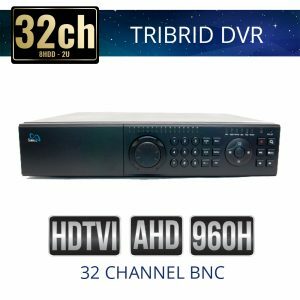 Sibell 32 Channel DVRs Quadbrids HD Over Coaxial Cable units are typically used in more high profile surveillance system security jobs, depending your particular requirements a 32 Channel DVR may still be an option for a home or small office building. Sibell DVRs are equipped with an advanced feature set, motion detection recording, camera management tools, and backup search control. The Quadbrid DVRs offer inputs for TVI cameras, AHD 2.0 Cameras, Analog Cameras and IP cameras. Sibell Quadbrid DVRs are compatible with ONVIF cameras making Sibell a flexible high performance system that you can be pleased to offer.